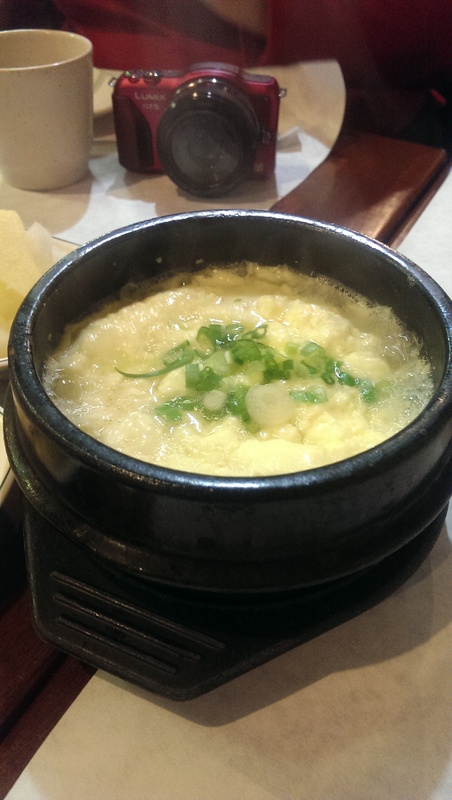 I recently learned about Seoul Garden from one of my foodie groups, and I am so glad we went. I ate dinner there recently with several friends on a cold, rainy evening. The place is a bit of a hole in the wall, and the dining room is nothing special. One of my friends lives around the corner and had always wondered what it was like. She was thrilled when I scheduled this. It may not look like much from the street, but what makes it special is the authentic food. 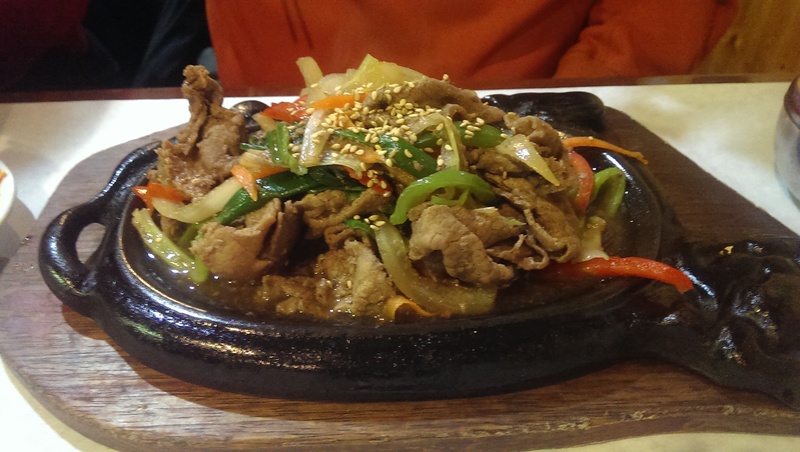 There were several tables of Korean diners enjoying barbecued beef and some kind of hot pot soup or casserole – both served over hot plates at the table. We were greeted with a mug of hot tea. Some of us smelled barley and some of us smelled corn. 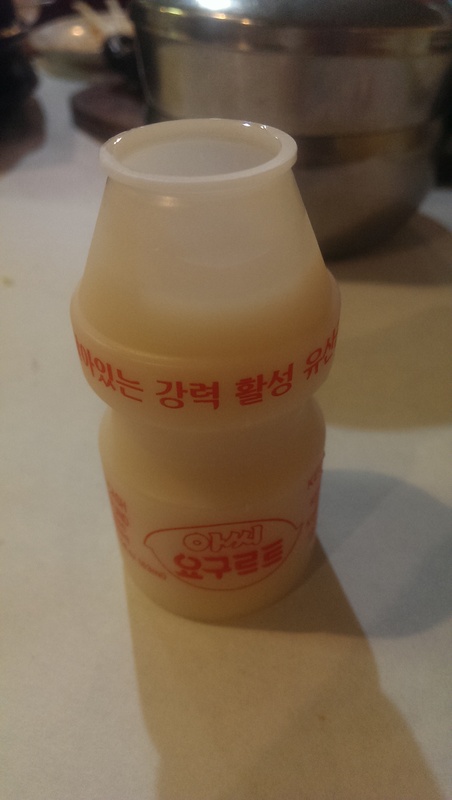 Whatever it is, it is completely additive, because I came home still tasting it on my palate and want it again soon. The highlight of the meal is the banchan – an array of small kimchi and pickled root and vegetable dishes, including several kinds of kimchi (cucumber, bok choy and cabbage), a kind of seaweed salad, some kind of delicious potato dish, what might have been cubed radishes, Gyeranjjim (Korean Style Steamed Egg Casserole, see second photo), and some other dishes that we just ate without knowing what they were. I liked everything I tried. It was a fun way to try a bunch of different dishes. 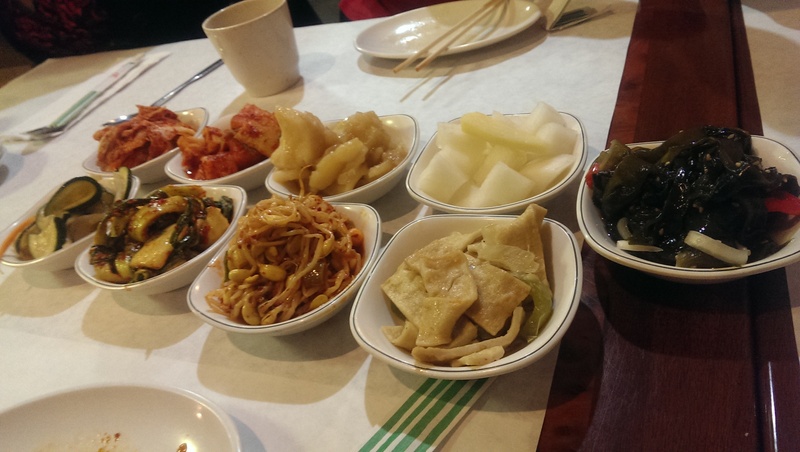 We ordered a couple appetizers even knowing that we would be served Banchan. I ordered the fried dumplings. 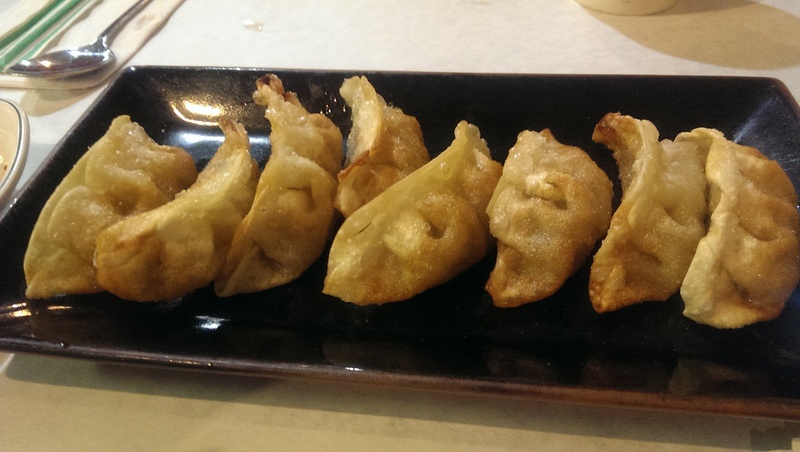 They were good – deep fried dumplings served with a dipping sauce. The rice dumplings (Ddukbokkie – fourth photo) were really unique and different. Long dumplings made from rice flour covered in a spicy and sweet red sauce – they were delicious. One of my friends explained that people either love them or hate them (due to the texture), but we all thoroughly enjoyed them. Another friend ordered the spicy tofu. It was good, but there were so many other things to eat I only had one piece. After debating what to order we ended up ordering 3 orders of Gopdol Bi Bim Bap, 1 order of Bulgogi and 1 Tonkasu. We are big sharers, but that wasn’t the case tonight – although I did manage a bite of BiBimBop and Bulgogi. 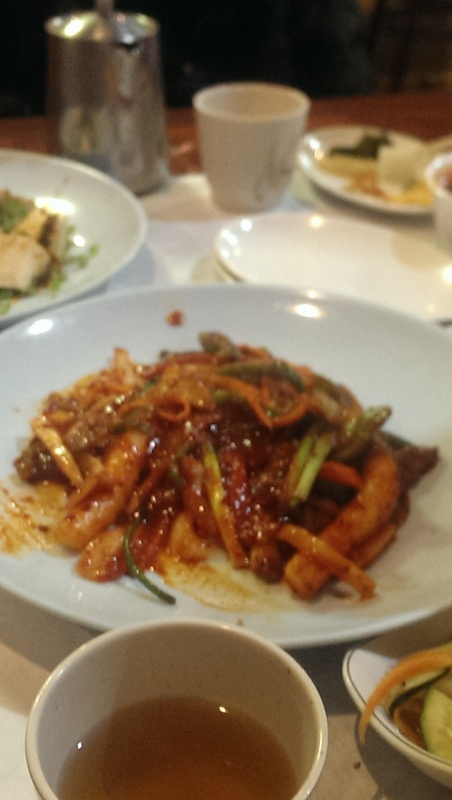 The Bulgogi was cut thin and served with various peppers and what may have been spinach. It was definitely delicious. They serve two kinds of Bi Bim Bap. 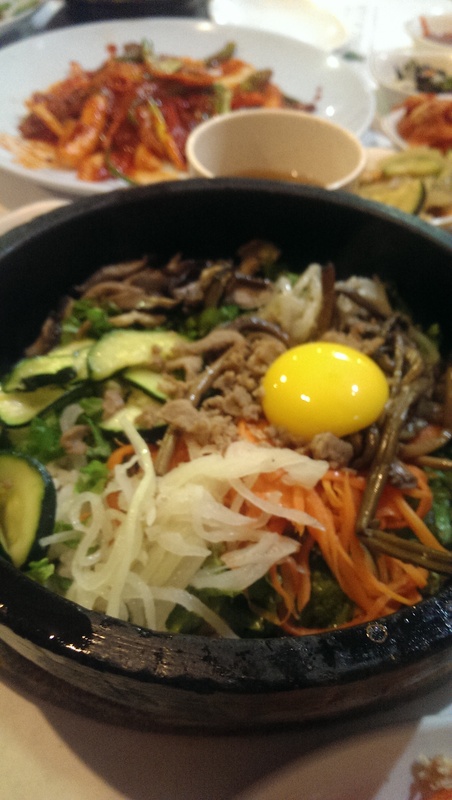 My friends all ordered the Gopdol Bi Bim Bop, which is a rice, meat, and vegetable mixture served with a raw egg cracked on top. It is served in a sizzling hot stone dish, and it is a good idea to wait a minute or so to let the rice on the bottom get somewhat crunchy. You then stir the egg through the other ingredients, and the heat from the bowl cooks the egg. Everyone had their leftover Bibimbap packed up, and one friend looked forward to eating it for breakfast the next day. My Tonkasu was a fried pork cutlet with a deliciously sweet sauce on top. It was served with rice and what they called a Seoul Salad, but it was essentially iceberg lettuce with some kind of smooth dressing on it. It did a nice job cutting the heaviness of the pork cutlet. 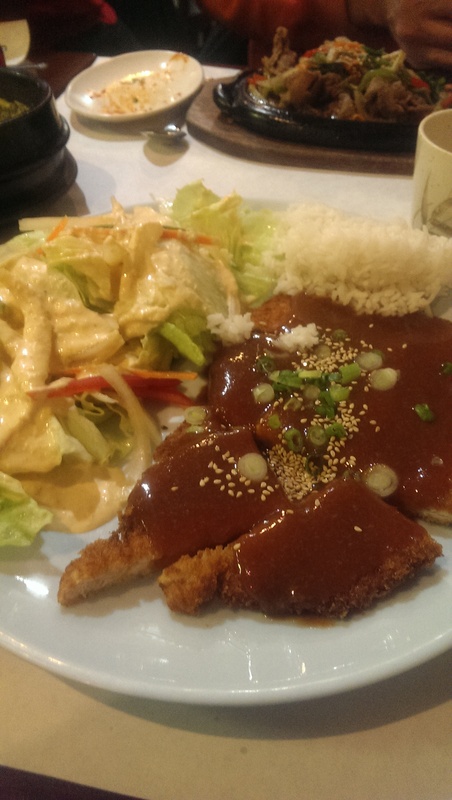 I really liked it – even if the pork cutlet was probably a food service cutlet. The sauce really made the dish. I was impressed with the speed of the service once we ordered the food. Our server remembered everyone’s order without writing it down, and then brought everyone their food very quickly. The dumplings were brought out probably within a minute of ordering. 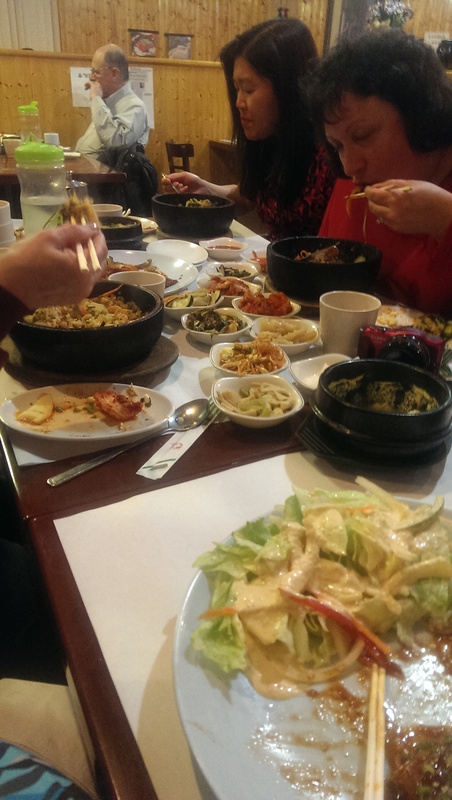 The banchan and other appetizers were then served, followed by the entrees. I was expecting very spicy food, but that wasn’t the case. I suspect they lowered the spice level for us – although a couple of my friends can handle it. I for one thoroughly enjoyed every bite. I only had one bite of rice dumpling that had me coughing from the spicy kick. They also serve water in a plastic water bottle, so we could serve ourselves. Canned soda lines the hallway to the bathrooms. There are no aesthetics here – just good food. At the end of the meal we were served a delicious drinking yogurt (Yakut). We couldn’t decide whether it was mango or banana or what, but we all agreed that it was delicious. Our server gave us each one to go after we raved about it as we left. In any event, the place is easy on the pocketbook. Our dinners averaged to around $20 a person. The prices are very reasonable given the quantity and quality of food.